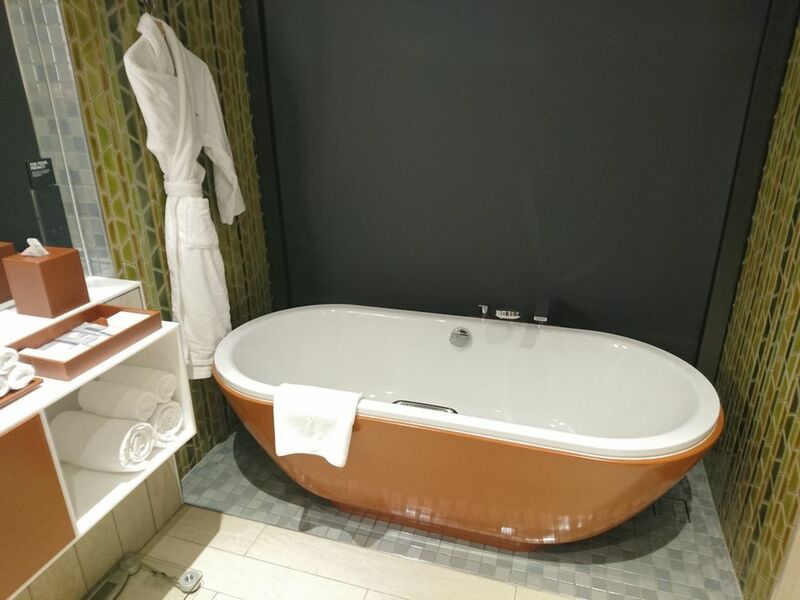 It’s been 5 years since we last visited the Crowne Plaza at Singapore’s Changi Airport, and as far as airport hotels go, we were impressed with the features and amenities it had on offer. 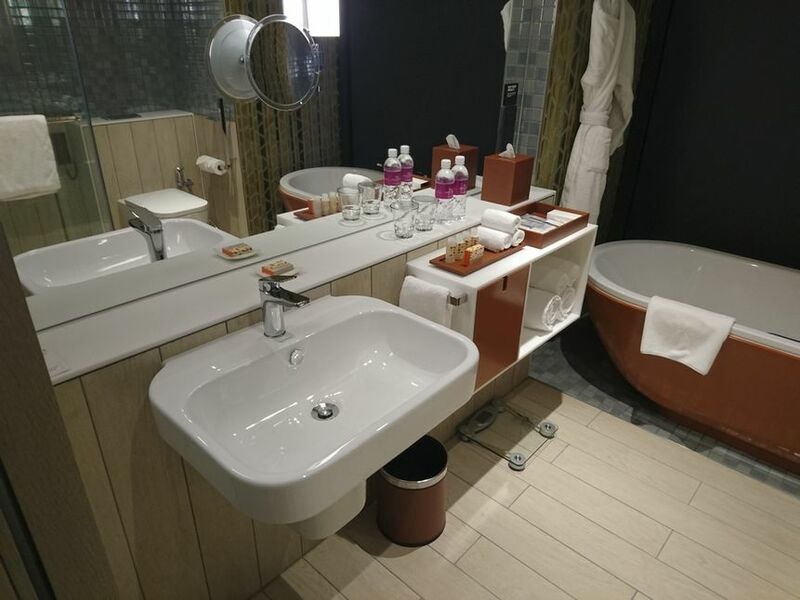 Now, we revisit the Crowne Plaza just after the opening of its new Jewel Wing, which adds another 243 guestrooms to the existing building’s 320 rooms. The Jewel Wing extension of the Crowne Plaza comes in concert with Changi Airport’s own ‘Project Jewel’ – a massively sprawling expansion with an additional runway, a mega-terminal, and even more retail outlets, all with an eye on doubling overall capacity in the coming years and retaining its crown as Asia’s premier transportation hub. 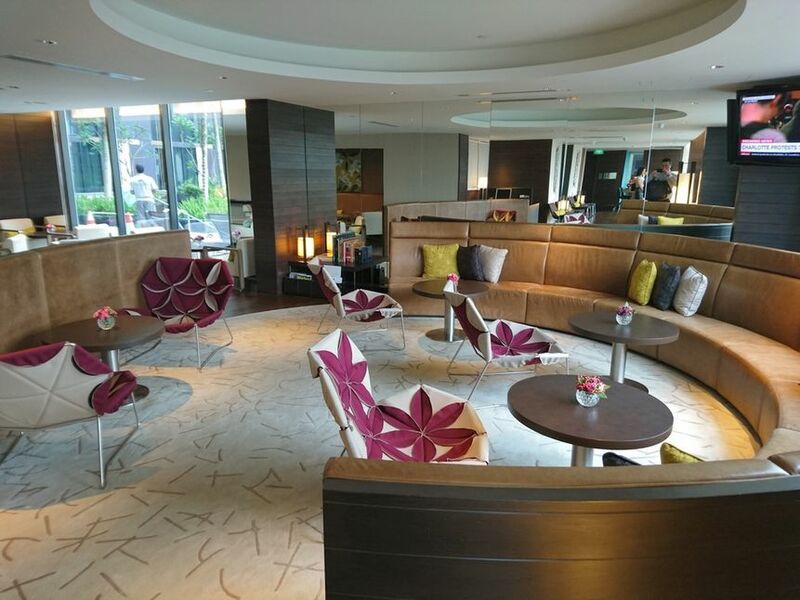 For a long layover, or a quick business meeting in Singapore with colleagues before heading to other destinations, it’s difficult to beat the Crowne Plaza’s location connected directly to Terminal 3. We got off a flight in Terminal 1 and thanks to a very short customs queue and no luggage to collect, we were able to make it to the hotel lobby in less than 10 minutes. The Crowne Plaza itself is an impressive building – the orchid-inspired outer membrane helps regulate heat and noise, and there’s a tropical resort ambience that suits Singapore’s humidity and heat rather well. The 10-storey Jewel Wing extension to the Crowne Plaza is in a separate building (pictured above to the right of the main building) that’s a 2 to 3 minute walk from the main hotel building – this is probably its biggest annoyance, but all things considered it’s a small price to pay for its prime location within the terminal. 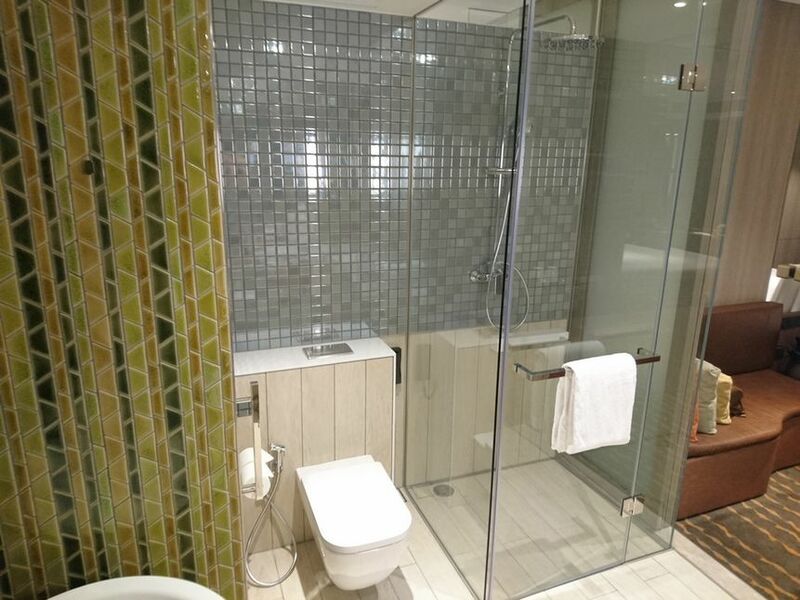 To suit the varied nature of incoming and outgoing flights from the 24-hour airport, the hotel offers early check-ins and late check-outs, as well as an express check-in option. The staff is friendly, and after checking in, we make the trek over to the newly-opened Jewel Wing and eagerly anticipate what changes have been made to the rooms since our last visit. 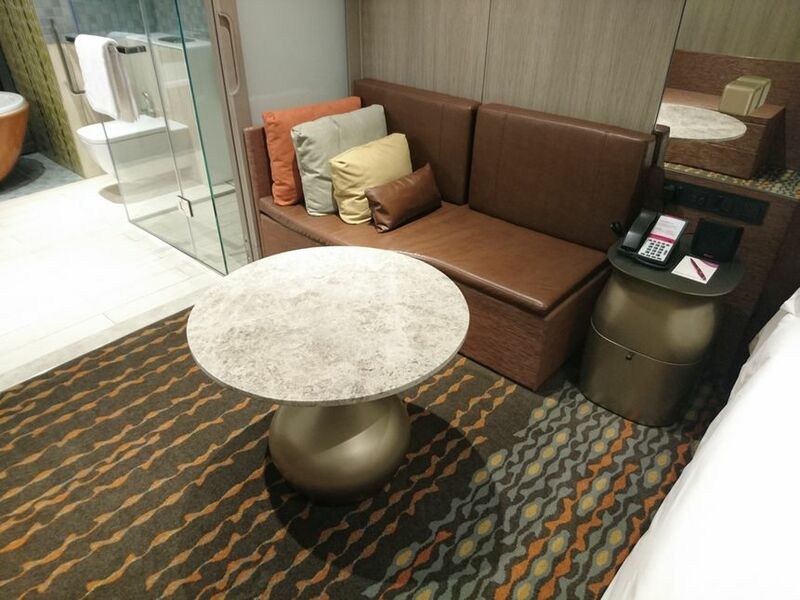 The Crowne Plaza retained what we has liked about the hotel previously, which is that it’s well setup for business travellers in terms of amenities and is still far better than any other airport hotel we’ve stayed at. ...with a separate breakfast area plus evening cocktails and canapés. 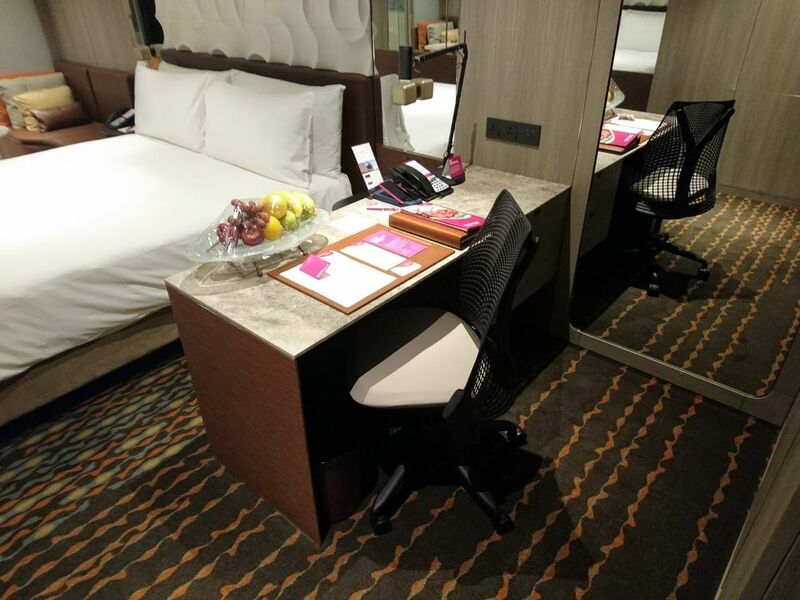 ...and a dedicated work area complete with an ergonomic Herman Miller low back office chair – this solves the pain of using a dining chair at an uncomfortable table height that so many other hotels seem to prefer offering. While the work area has both international power sockets and USB ports for charging your devices, it would also have been nice to have a socket near the bed. ...and there’s also a Bluetooth speaker so that you can play your own music easily – both features that we loved. 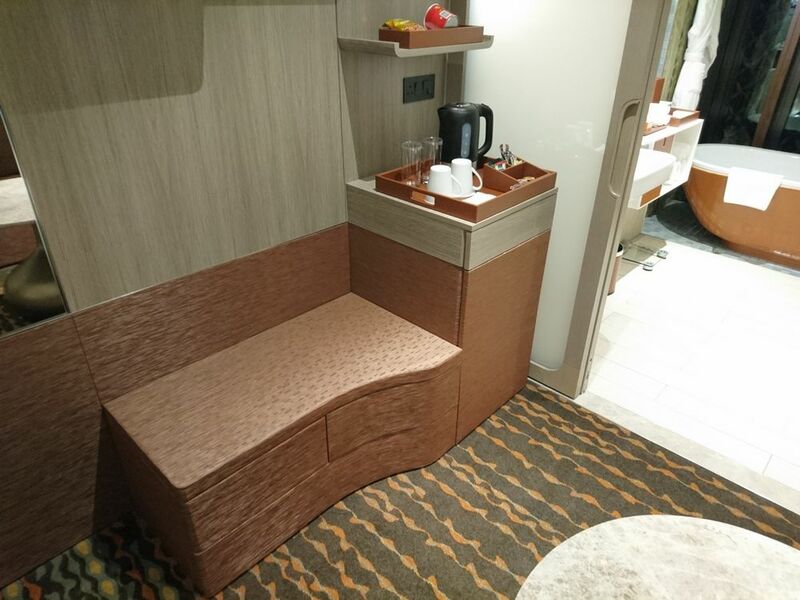 The Crowne Plaza also provides a kettle and some instant coffee / tea making facilities, so if you’re after an espresso you’ll need to head out, but we did welcome the three bottles of complimentary water, especially in Singapore’s weather. 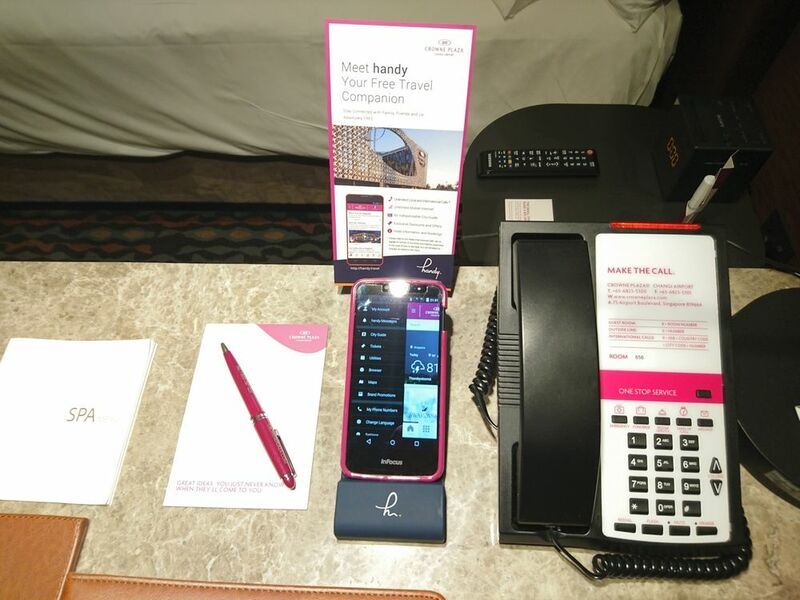 Another amenity was the aptly named ‘Handy’ phone – a smartphone that’s complimentary for your stay and allows you to call 11 different countries for free, and also use it to tether data from while you’re out and about. ...and amenities by Orla Kiely. Thanks to the double glazed glass, noise from the airport is kept at a minimum. During our two night stay we heard quite a few aircraft take off, but the noise was not more than the room's air-conditioning unit. There are also dedicated “Quiet Zone” rooms available that promise minimal noise and distractions if you’re an especially light sleeper. Working at the Changi Airport Crowne Plaza is bolstered by a number of features. 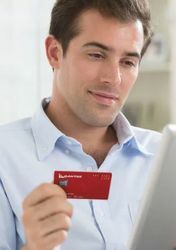 In-room, there’s the separate working area with a comfortable office chair, as well as complimentary wired and wireless internet with decent speeds for most light business tasks. Also offered up is wireless printing – once your documents have printed, you can collect them from the on-site Business Centre (pictured below) or have them sent up to your room. Other business services can be provided by the staff of the Business Centre, but this is not staffed 24 hours (there’s rather odd manned hours of 2PM to 11PM, weekdays only), so you may have to get in touch with reception instead. Apart from in-room dining and the canapé selection in the Club Lounge, the Crowne Plaza also offers two on-site restaurants. ...serving up a mix of Asian and Western dishes in both buffet and a la carte style. We had breakfast here on both mornings and found the buffet range to be plentiful and diverse, with western, Chinese, and even Indian selections. There’s also Imperial Treasure, which focuses on Cantonese Cuisine and speciality dishes. Externally, there’s a number of options within Changi airport itself, or you can opt to spend 30 minutes on the MRT to head into town, which is well worth it for some authentic Singapore Chili Crab. ...as well as the more casual retro themed bar’75 offering up a pool table and sports on the televisions. 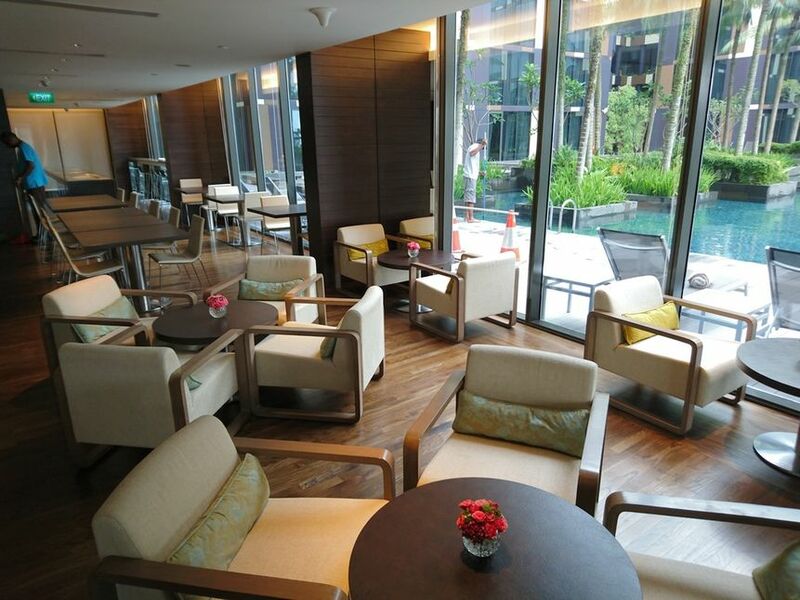 If you want to relax at the Crowne Plaza Changi airport, the outdoor landscaped pool is not to be missed, and unlike the Aerotel transit hotel we wrote about last year, there aren’t pool passes sold to the public, so you may just find it a little less busy. For the gym junkies there’s a 24-hour fitness centre with the usual mix of treadmills, stationary bikes and free weights. Overall, the new Jewel wing of the Crowne Plaza ends up offering the same features and amenities that we encountered on our first visit, but there’s really not a lot to complain about - especially considering you don’t really lose any features that a well-appointed four or five-star hotel might offer, and you’ve got the convenience factor of being a stone’s throw from the airport terminal. A former technology writer and motoring editor, these days Sid spends more time at the pointy end of the plane with a good whisky in hand. Project Jewel is only the project situated between/in front of the current terminals, not T5 and the third runway. Also its MRT not MTR. Informative review, thanks. Is the original hotel building being refurbished now the new section is open? I've stayed there numerous times & think that some of the 'original' rooms are starting to look a bit tired. The thing I loved most about this hotel was that the doorways are wide enough to take a luggage trolley. In my stay I had a long connection between two different airlines, I collected my luggage and wheeled it into and out of my room, so very easy. It is an expensive hotel. The food in my the evening buffet is not as good as it used to be. But excellent location and great views over the runway. The Changi Crowne Plaza beats the Regal Airport Hotel in HK hands down. Another feather in the cap for an already excellent airport. Singapore Airlines drops their ridiculous lounge policy at SIN and open up the Silver Kris lounge to OWE/OWS flying Economy. I would even tolerate the lack of amenity kits in Business Class! The only reason I'm not flying through Singapore more is the fact that SQ is a member of Star Alliance, and therefore poor connections to Asia flying OW carriers. I'm sorry SQ, contrary to belief, you are stronger as part of an alliance, even if you think SQ is a fantastic carrier. Just ask MH - I would not touch them with a barge pole had they not been part of OW and a source of reasonably priced FF points! I've stayed here half a dozen times in transit, love this hotel. Always a welcome oasis in the midst of travel. World's best Terminal based hotel from my experience. 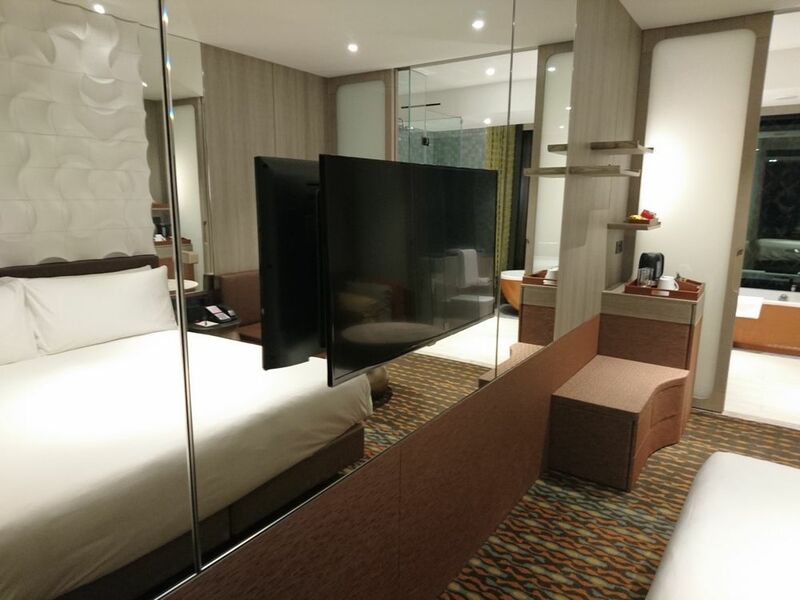 Comment on "Crowne Plaza Hotel, Singapore Changi Airport"